I’m always looking for more space and these storage ideas really helped me to organize the place. Really liked the unders stairs storage idea. Always on the lookout for more storage, no matter how big my home is. There is always some thing that need more space and can’t be put anywhere. 1. Get a smart storage bed! If you have a small bedroom and storage space in it is constrained, think of a practical solution such as going for a storage bed. A storage bed? Yes. This is a bed that also provides for space storage. If you are asking why a storage bed, the answer is plain simple. You will be killing two birds with one stone! 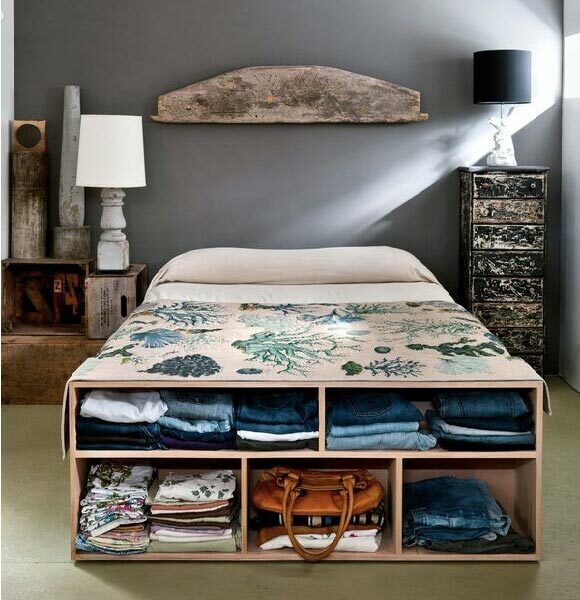 Storage beds offer plenty of space if well designed. In this bedroom, the bed has a rear storage unit that is well subdivided into drawers to maximize on the space. We love this idea because it is very practical and makes the space look neat and tidy. However, we think you can do better by having the storage unit designed with a more stylish appeal. 2. Such a clever idea! If your storage space is limited horizontally, then opting to go for wooden crates which can be mounted vertically on the wall can be a great idea. Wooden crates are just great for storing all kinds of objects including; clothes, books, toys and other accessories. They offer enhanced visual appeal, functionality and definitely personality. Plus, installing wooden crates is just a simple do-it-yourself project. What we love about this idea is that it creates very functional additional storage space and improves the general appeal of the whole space. However, we think you can do more by adding color, style, and some customization in the creation of the wooden crates for uniqueness. Whenever you are short on storage space, it’s your level of creativity that will save the day. Going vertical is the best way to maximize your storage space as well as utilize spaces that seemingly look empty. There are many ways with which you can design your vertical storage and this depends on the location, size of space and items to be stored there. 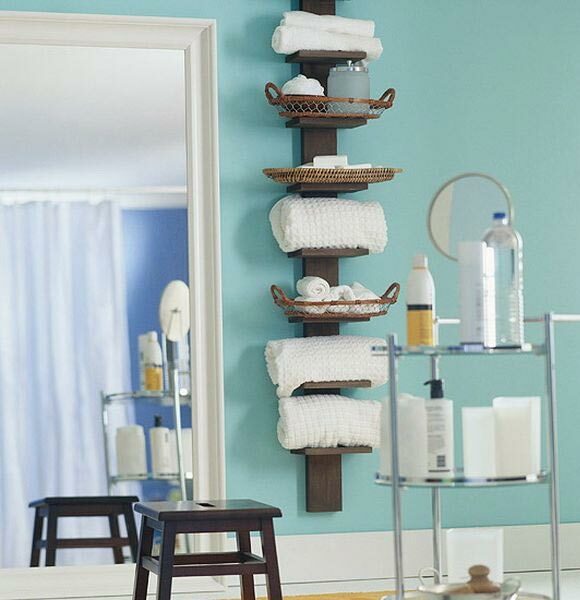 In this bathroom, the wall-mounted spine storage unit features a simple yet very appealing and functional design. Of all storage ideas that’s the one for a perfect bathroom. Here, you can store items such as towels in a very appealing way. We love this idea because of its simplicity and high elegance. However, you can do better by adding an extra storage spine to increase the storage area. There are some items that could really give you a challenge when looking for space to perfectly keep them. 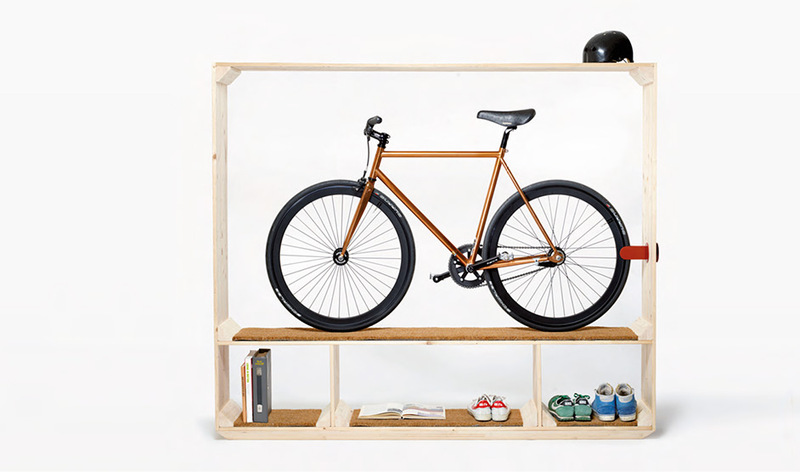 With items such as bikes and limited space in your storage area, you can opt to go for a simple idea that involves using a simple standing storage rack. A rack such as the one in this photo acts as a perfect storage unit for several items. Your bike will perfectly rest on the upper space while other items such as shoes and bike riding gear are placed on the lower open cabinets. We love this idea because it offers great storage functionality and is also appealing to the eye. Your garden tools need to be well stored for protection against harsh weather elements such as snow which could even lead to their rot. Therefore, developing a simple storage unit that serves both on functionality and appeal to the eye is a great idea. 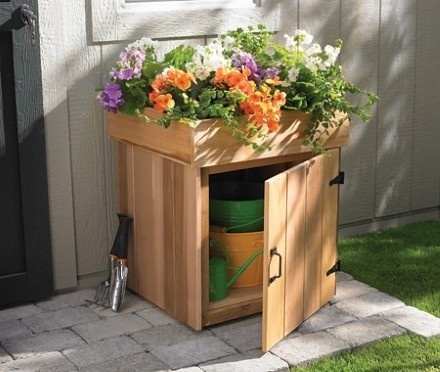 The garden wooden dresser above is a great storage unit for your garden tools such as watering cans and basins. We love this idea because the storage unit serves well on functionality and appeal. It is also durable if well constructed and maintained. However, we think you can do better by making it larger so that it can even accommodate larger tools such as shovels. Are you tired of searching for your pieces of jewelry in a bowl or vase where they most likely get entangled and therefore become hard to pull out? Well, if you are, then perhaps it’s time to adapt this creative jewelry storage idea. This storage unit enables you to smartly arrange your jewelry pieces by hanging them vertically in an open shelf. 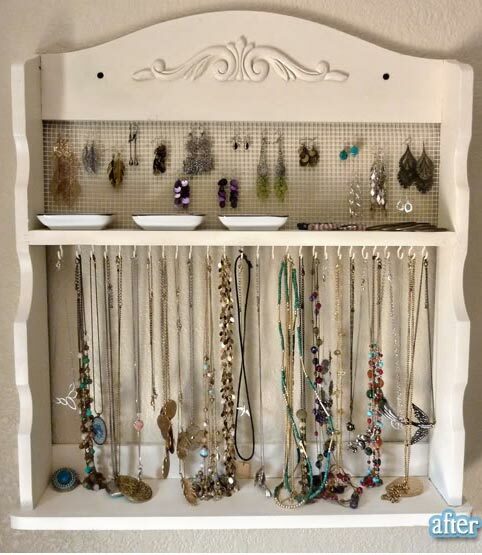 We love this idea because it serves great as a smart, organized and appealing unit of storage for your pieces of jewelry. You can easily arrange and retrieve the jewelry from the unit because it is open. Kids stuff can be in plenty and will appear disorganized if not well stored. Getting a good storage unit for them can be a challenging task if you are short on space. However, this storage idea will help take away this hassle from you. The various storage cabinets on this unit are easy to pull out and push back; hence making it easy to store as well as retrieve the play items. We love this idea because it serves great on functionality. It also provides a play area on the top, enabling you to kill two birds with one stone. Would you like to hide your shoes behind a stylish and highly appealing enclosed wooden shoe rack? Well, if you would, then this idea is for you. 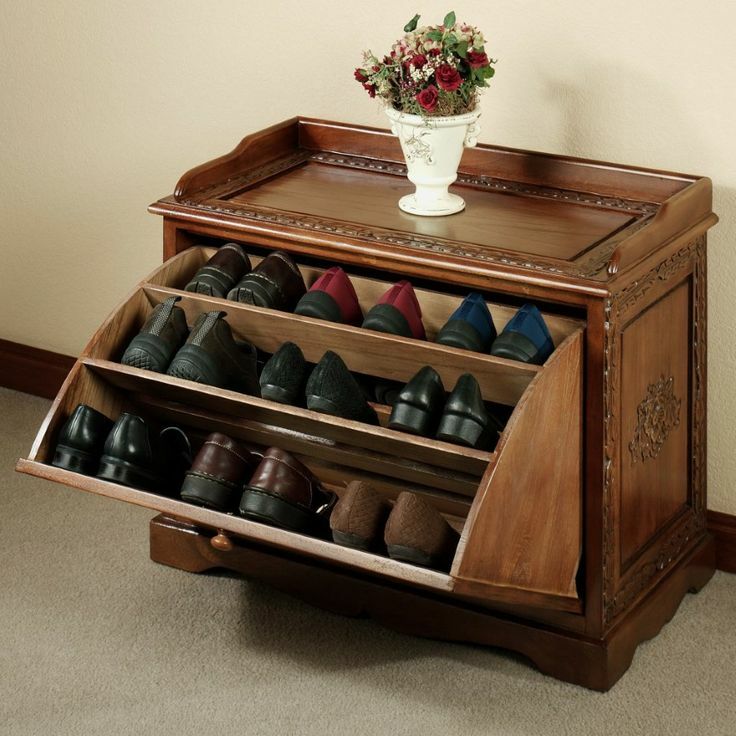 This idea offers a better storage unit than the traditional open shoe racks which expose your shoes even when you do not want them exposed.This rack has column drawers that open out easily to display all your shoes in a well organized manner. We love this idea because it keeps your shoes locked away, is easy to store and retrieve, and the wooden finish offers great appeal. However, you can do better by getting a larger storage because this one only supports 9 pairs. Your laundry unit is one place that should be fully maximized for the storage of dirty laundry as well as other items you prefer stored here. In this laundry, the idea of using bags hang on the wall to serve as additional storage for certain items is not only ingenious, but also very appealing. By hanging the bags vertically, you are able to maximize on the storage space that is there along the wall. What we love about this idea is the functionality and maximization of storage space that it delivers. 10. 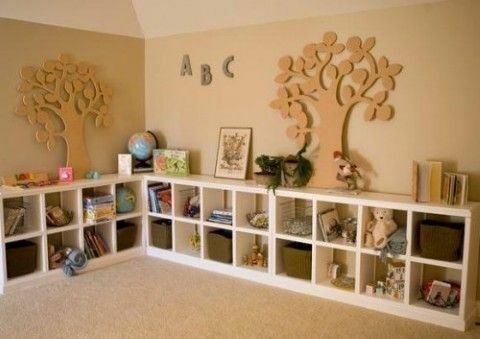 Gorgeous and Artsy kids playroom storage! Do you want to make your kids playroom look not only organized but also cute and fun for your kids play? This idea helps you to incorporate artwork into the kid’s playroom organization design. You can use types of artwork that the kids are more likely to associate and play with. 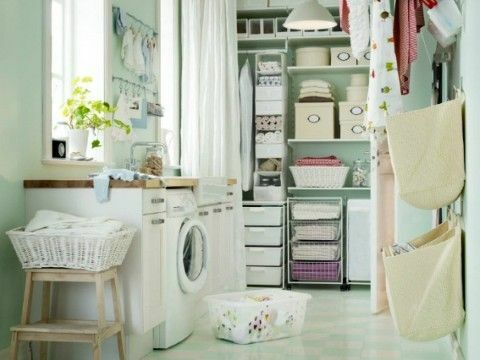 There are more storage ideas for kids in the list. Open low cabinets provide very functional storage space where your kids can easily store and retrieve their play items. We love this idea because on top of functionality, it delivers greatly on eye appeal. However, you can do better by incorporating more colors to the design as they tend to make the place more ‘kid-friendly’. 11. 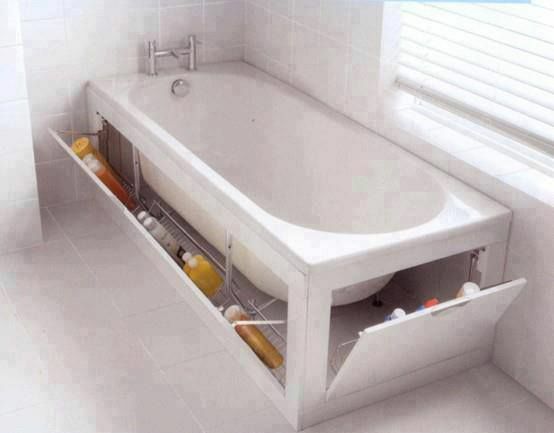 Storage under the bathtub! Some storage ideas are just phenomenon. Your creativity and imagination is the limit to what you can achieve with such ideas. In this bathroom, the space under the bathtub has been very well utilized. The walls of the unit, which also act as its doors, are the ones that offer space to attach your bathroom items such as detergents and cleaning gels. What we love about this idea is that it creates additional storage space where not many would even think it is possible to do so. It’s also very easy to store and retrieve items. This is just one of the best storage ideas ever. 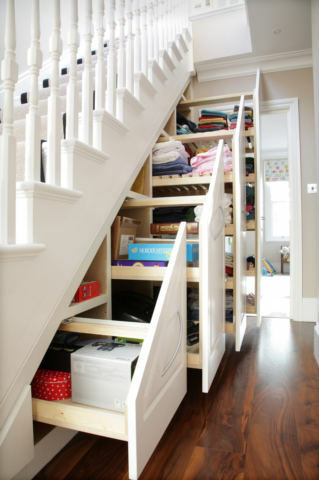 The space below your staircase is large and can be very functional if well designed for storage. In this understairs storage, the space has been very well organized into drawers that are push and pull. The drawers are custom designed to fit and match the design of the staircase as well as the interior décor of the home. With this storage, you can easily conceal your stuff under the stair case. We love this idea because of its appeal and high level of creativity. Also, the style can be tailor-made to fit different designs of staircases. Again, we meet an idea that entails exploiting your wall to from some creative storage space. 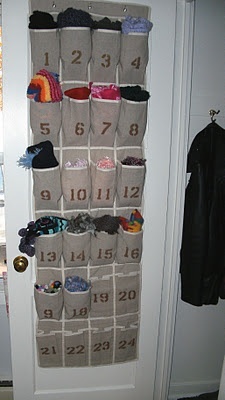 In this room, an array of well-labeled units for scarf storage is well laid out across the wardrobe door; from top to bottom. This storage space exploits the otherwise empty space on the wardrobe door and makes it very functional for the storage of your scarfs. What we love most about this idea is that it is a budget-friendly and easy do-it-yourself project. One of the best storage ideas on the list. However, we think you can do better by twitching the layout to prevent some of your scarfs from getting crises. 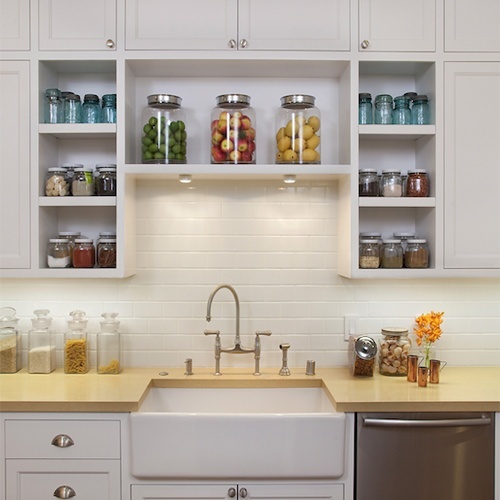 If you are looking for a storage style that is likely to transform your kitchen from just ordinary to something that will raise its appeal, then consider utilizing this farmhouse jars idea. The kitchen above shows very well-laid out jars placed in some open shelves. The jars vary in sizes depending on the items they are supposed to stock. Jars are always considered as a great storage ideas. Their transparency enables you to easily identify the products in them. We love this idea because it is very easy to apply in your kitchen. It is also very eye catching when well planned and organized. Utilizing the space under your staircase for storage will always be one of the greatest ideas you can implement in your home. In this home, the space under the staircase is well developed into enclosed cabinets with doors. The cabinets also have shelves that help to maximize on the cabinet storage space available. The idea also incorporates some picture frames to enhance the appeal of the storage space. 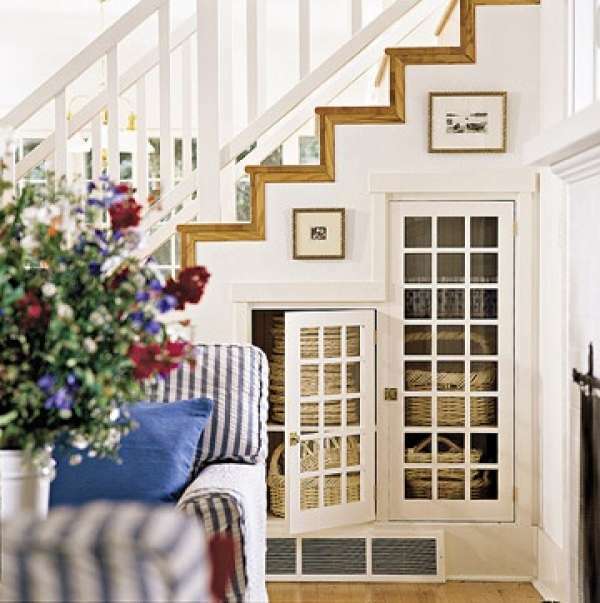 We love this idea because it is very functional and utilizes the empty area under the staircase well. However, you can do better by incorporating a ‘not-too-common design’ such as using custom-made draw-out drawers. This fabulous make-up organizer offers a perfect make-up storage unit for all your beauty items. Plus, it offers a spectacular see-through glass top that enables you to see and pick the make-up item you want from the storage unit under it. The beauty items are also easily accessible from their storage point, making your make-up session faster and fun. 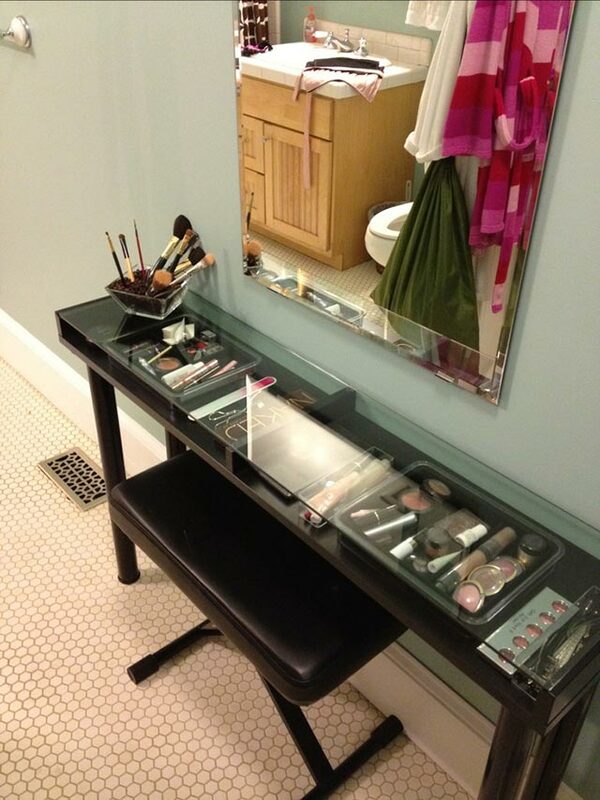 The large mirror also perfectly adds to the functionality of the organizer. We love this idea because it is simple and yet very functional. However, we think you can do better by having a few enclosed drawers within the organizer to keep some items under lock and key. If you are a book enthusiast, you understand the need to have a lovely and yet functional book storage unit all at the same time. In most cases, one of the two aspects will be sacrificed for the other. However, with this modern and trendy wall book storage idea, you can achieve both functionality and appeal under one roof. 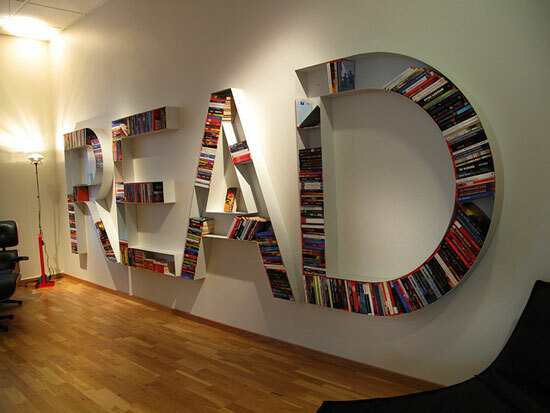 In the above storage unit, the books are stylishly arranged on a customized design mounted on the wall. Of all storage ideas this one is the most trendy. You can design your storage type in whatever way you want. We love this idea because it’s very unique, trendy and modern. It offers great eye appeal, functionality, and is just a great decoration idea. Keeping your dishes organized, safe and easily retrievable can be a daunting task without the right dishes storage idea. In this kitchen, the dishes are well organized in this wall-mounted custom-made shelf. The shelf has dividers that help to keep your plates standing or vertical for easy storage and retrieval. 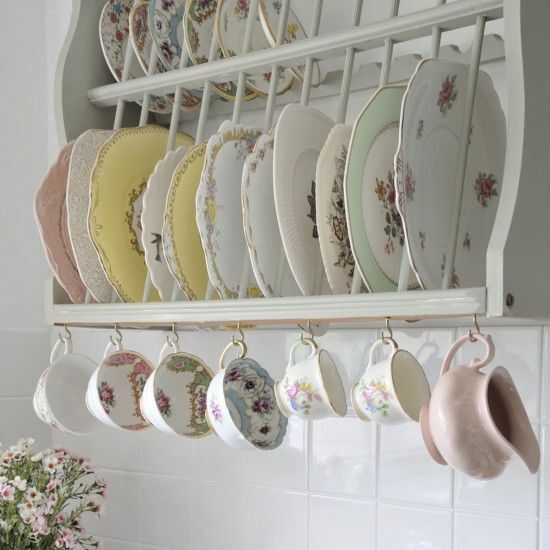 The shelf also has hooks that allow you to hung your tea cups in a simple but yet very elegant way. We love this idea because of its simple elegance and functionality. The organizer is also open so you do not have to keep opening and closing doors when using the dishes. 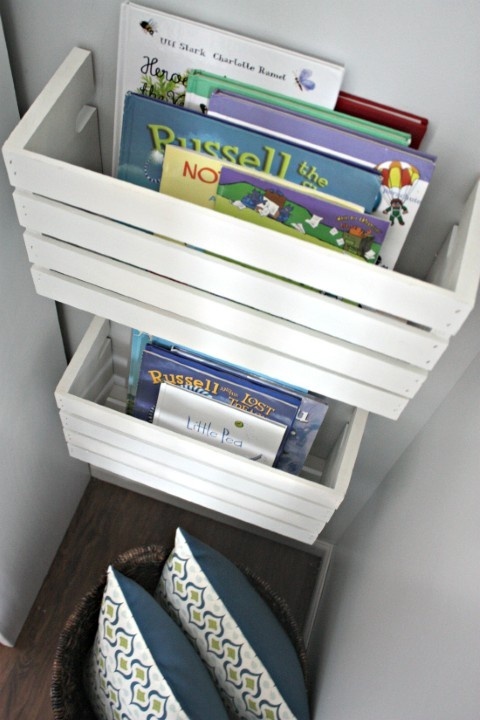 This is among the simplest of all storage ideas to use. 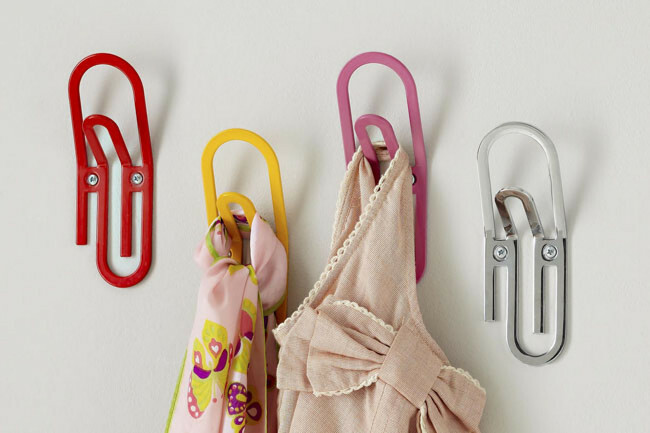 Using wall hooks allows you to exploit the space on walls that is always left unused for the lack of a better know-how. Wall hooks can be used pretty much everywhere including; in the bedroom to hang coats and bags, kitchen to hang cleaning towels, and the bathroom to hang body and face towels. There are many designs of wall hooks that you can utilize, it all depends on your tastes and preferences. We love this idea because it is budget-friendly, functional and easy to do by yourself. Your kid’s playroom will always have plenty of items and toys that not only need space for storage, but also need to be well organized. 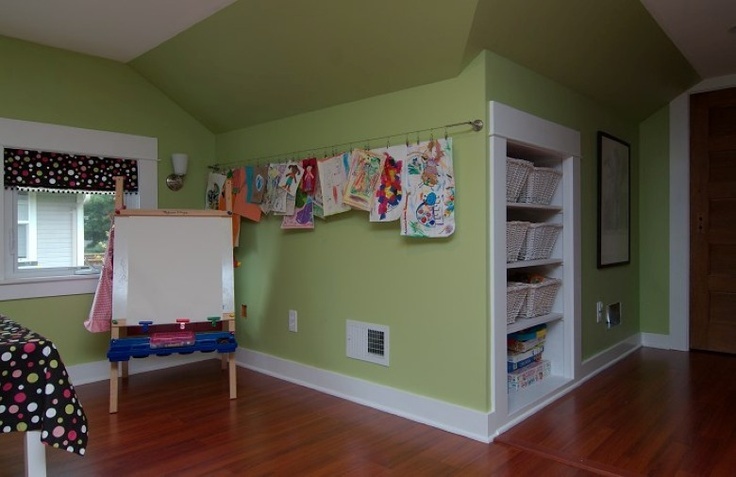 In this kid’s playroom, some cupboards have been incorporated on the wall to maximize on the storage space that would have otherwise been left unused. Cupboards form great storage units as your kids can easily place their toys in them and retrieve them easily when need be. 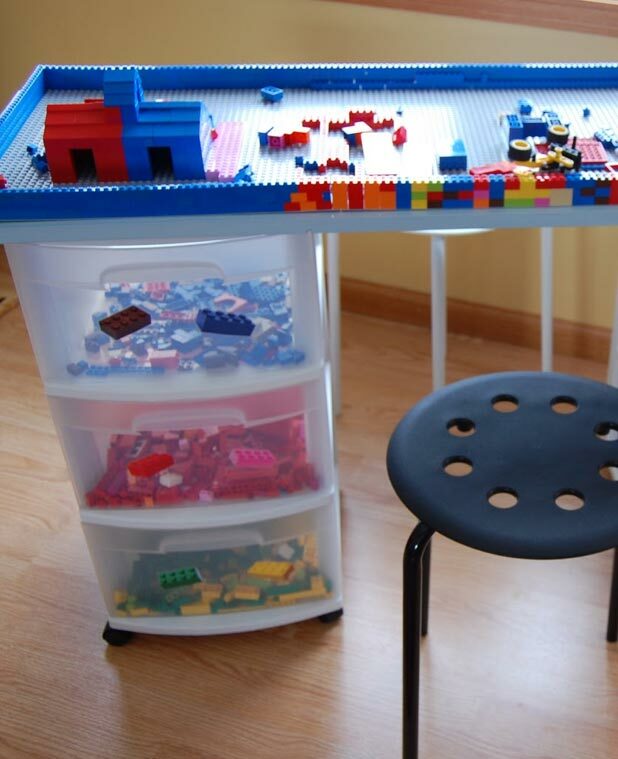 We love this idea because it is very appealing, functional and easy to use for the kids. However, if your kids are really small, opt for cupboards that are horizontal on the wall to make them reachable for the kids.